Sony's innovative XDCAM EX professional product range is specifically designed to exploit the ultimate high speed performance and reliability of SxS PRO and SxS-1 media. However, SxS media is a professional format and not available from retail outlets, so in situations in the field where additional media is required or for cost-conscious users, where this ultimate performance is less important, Sony have developed the MEAD-MS01 adaptor to enable the use of consumer Memory Stick media. The MEAD-MS01 adaptor is the same shape as SxS memory cards so as to fit within the media slots on XDCAM EX camcorders, with no protrusions, allowing the media cover to be in place during shooting. The adaptor can accept one high speed Memory Stick which simply slots inside. 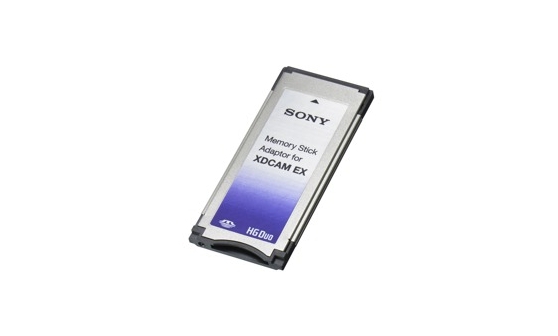 At the time of writing (October 2009), Sony Professional recommends only the Memory Stick PRO-HG Duo HX Series - specifically the MS-HX8G (8-GB), MS-HX16G (16-GB), and MS-HX32G (32-GB) are recommended. Using 8-, 16-, or 32-GB media, approximately 35, 70, or 140 minutes of recording (in SP mode) can be achieved. Please note, it is not recommended to utilise the Slow Motion recording function due to speed limitations of Memory Stick media. The nature of the adaptor and Memory Stick media will also mean slightly less reliability than SxS media - caution should be exercised when turning off XDCAM EX hardware during recording. XDCAM EX hardware may need firmware upgrade to use MEAD-MS01 - please see specifications for more information. The MEAD-MS01 has been specifically developed by Sony to operate with XDCAM EX hardware and, as long as users follow the usage guidelines with recommended Memory Stick products, they can be confident of the correct operation of their XDCAM EX hardware. The MEAD-MS01 Adaptor has the shape of ExpressCard/34 so it can be slotted into the ExpressCard slot of XDCAM EX equipment and other ExpressCard compatible hardware, such as a Windows PC or Mac. Please note the interface standard between the PC and MEAD-MS01 is not PCI Express but USB2.0 - however both PCI Express and USB2.0 are supported as the ExpressCard interface. Memory Stick media recorded with MEAD-MS01 by XDCAM EX hardware works on a PC without any need for drivers. The USB adaptor bundled with Memory Stick PRO-HG Duo HX series is recommended. USB connection of XDCAM EX equipment to a PC is also available. Folders and files of XDCAM EX are shown in the NLE operation window or in Clip Browser in the same way as with SxS media. However, users should not slot a Memory Stick with XDCAM EX recorded content directly into the Memory Stick slot of a PC because XDCAM EX uses a different recording format and this may lead to a read error that causes the data to be damaged. The PXU-MS240 240GB HDD back up unit for SxS media is fully compatible with the MEAD-MS01 adaptor - simply slot the adaptor with Memory Card into the PXU-MS240 unit to record content onto the MS240's hard drive. The PMW-350 and PMW-EX1R will ship with firmware compatibility for the MEAD-MS01. The PMW-EX1 and PMW-EX3 can receive updated firmware via Internet download, while the PMW-EX30 and PMW-10MD will need returning to a Sony service centre as they do not have a USB service port for connecting with a PC. SBAC-US10 SxS Reader/Writer is not compatible because the SBAC-US10 only has PCI Express interface and no USB interface.